In a constant effort to fight spam, a lot of sites rely on some sort of CAPTCHAs. I recently came across a CAPTCHA on Twitter that asked a question that could trigger severe reactions from torture or abuse victims. This reminded me that I’d been meaning to explain how this particular question is an accessibility issue. Warning: This post may trigger bad reaction for torture or abuse victims. 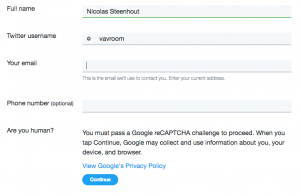 Twitter asks “Are you human?” on one of its contact forms. I had to contact Twitter when their algorithm erroneously flagged my account and locked me out (but that’s a story for another day). The only way to contact them was through a contact form. And I could not submit the form without using the Google reCAPTCHA. Fair enough. But they asked “Are you human?” as part of the form. This is really one from the realm of “unintended consequences”. On the surface this is a perfectly legitimate question – we are fighting spambots. The problem here can, in fact, be quite serious. Asking someone if they are human may trigger PTSD events in survivors of abuse or torture. Torturers dehumanize their victims by, among other things, asking “are you human?”. Simply rephrasing the statement or question to “prove you are not a spambot” would avoid this exceptional but very real issue.